During the initial emails between Sammie and I, she at one point referred to herself as a "pinning fool" in regards to Pinterest. It was in that moment, I knew I was going to love this girl! When I first met with her and Austin they seemed so FUN, bubbly, friendly and just plain wonderful! We planned their engagement session for several months after our meeting and crossed our fingers for Fall colors, and WOW did we ever get lucky! I'm pretty sure had we chosen any other day, the colors wouldn't have been this amazing! 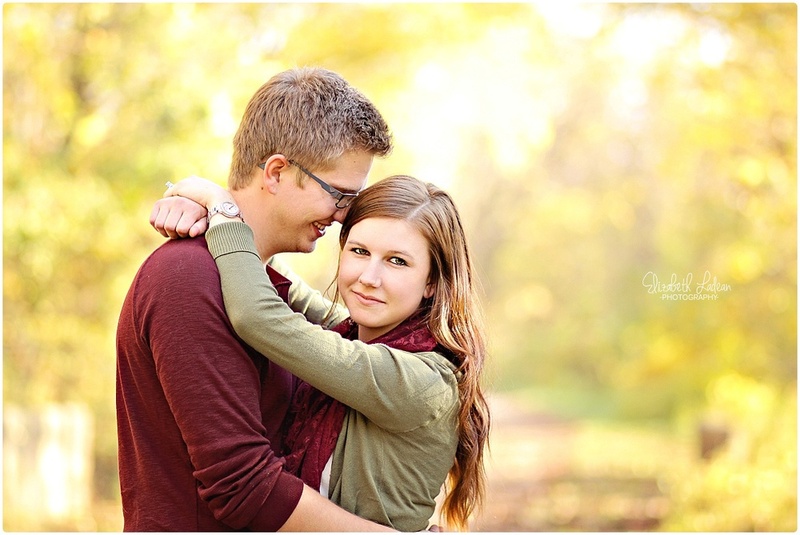 Their session, at Weston Bend was pretty much exactly what you hope for as a photographer ;) amazing weather, fall colors, and this too-cute couple who just know exactly how to nail it, every shot! Not to mention their precious dog, Ellie, who also nailed it! Sammie & Austin simply ooze that young love that you can't help but smile at. They are a perfect match! Sammie & Austin - Thank you guys so much for being so awesome!! I'm so excited for your wedding next year! Oh Sammie! Your "serious" face is perfection!